Progressive Neighbors held a Montgomery County Executive Democratic primary forum on Monday, November 13, at the Silver Spring Civic Center. 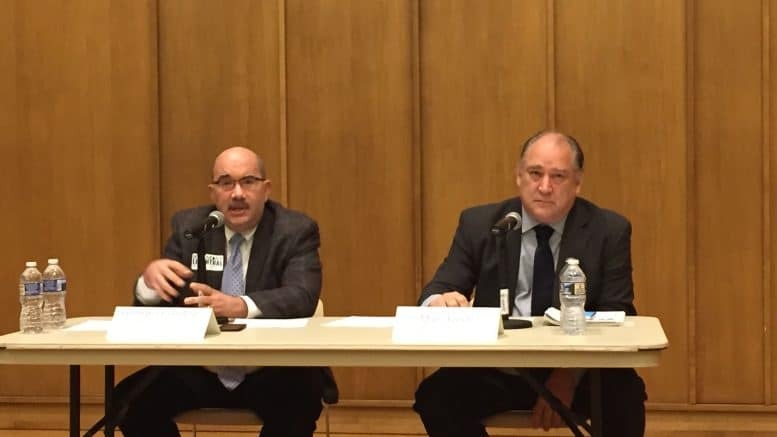 Only two of the six candidates running for county executive – Councilmen Marc Elrich and George Leventhal – accepted the organization’s invitation to attend. Elrich and Leventhal were introduced by a pre-selected member of the audience at 7:25 p.m., the rules were read at 7:30 p.m. and the moderators – Deborah Schumann and Joan King – asked questions of the two candidates. At 8:20 p.m., Elrich and Leventhal asked one another questions followed by audience-member questions. The event was finished by 9:30 p.m.
A Miner Detail captured video of the forum and will publish a full recap of the candidates’ responses in a subsequent posting. George Leventhal is winning, and David Lublin knows it.